If you don't know about Krita, you're really missing out. Krita is an exceptional, full-featured digital painting application designed for illustrators, concept artists, texture artists, and everyone in between. There is something for any digital artist to enjoy in Krita. And, best of all, it's free! There is a new beta version that has just been released that fixed some issues and makes it more stable now for OSX. In fact, from version 3.1 on, OSX is now officially supported! It is also available for Windows and Linux. Krita sports an intuitive user interface that is customizable and won't get in your way. 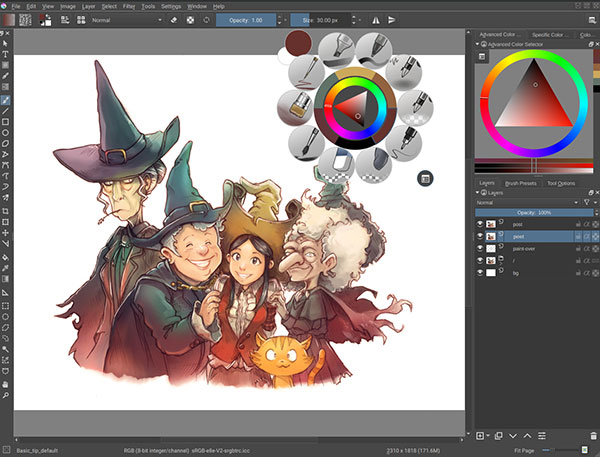 Features of Krita are many, including: layers, masks, over 9 unique brush engines with full customization, painting aids, PSD file support, HDR painting, and so much more. Check out the features page for more info. An extensive guide to Krita 2.8's features is also available in PDF format. If you are looking for a new edge to your art, you can't go wrong by giving it a try. Krita is free, open source software, licensed under the GNU Public License, and the user community has grown immensely over the last couple of years. With the new beta out, why not give it a try today?